Having the wrong garden hose takes the fun out of gardening. It's all about matching your needs with the right type of hose, so you don't end up with one that leaks, gets kinked, or is too short or too heavy. A good hose is a good investment. Though circumstances may warrant buying an inexpensive one, a quality hose that will last for many years is more cost effective than buying another cheap one each season. 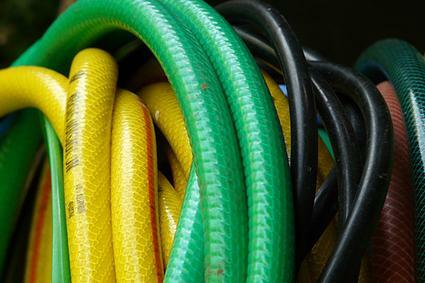 Modern garden hoses are made with layers of rubber or vinyl, or a combination of the two. Vinyl hoses are the cheapest, but they are quite susceptible to kinking, bursting under pressure and disintegrating in the heat of sun. The advantage of vinyl hoses is that they weigh less for their length than rubber ones. Gilmour makes a very economical 5/8-inch by 50-foot vinyl hose, available at HomElectrical for around $15-$20. Rubber hoses cost more but have thicker walls that prevent them from kinking and being cut. The rays of the sun do not degrade vinyl as readily. Craftsman makes a 5/8-inch by 100-foot premium rubber hose, available at Sears for just over $60. Hoses containing a combination of the materials are intermediate in price and combine the lightness of vinyl with the durability of rubber. Flexon makes 5/8-inch by 50-foot all-weather rubber/vinyl hose with a seven year warranty, available at Sears for $20. Whether vinyl or rubber, the number of layers - or plies - that a hose has largely determines its strength. Hoses may be labeled as as 1-ply, 2-ply, 3-ply, etc. There is always a trade-off between the durability of a thick hose and the light weight of a thinner hose. The most durable hoses also have an outer layer of mesh for reinforcement. Fittings refers to the parts at the end of the hose, which can either be plastic or metal. Brass fittings are by far the most durable. Plastic fittings can easily be cracked, crushed or have their threads stripped, causing them to leak. To choose the right length, consider how large your garden is and how far you'll need to go with the hose, keeping in mind that it's always easier to work with a shorter hose if you can. Common lengths are 10, 25, 50, 75 and 100 feet, though you can connect more than one in a series to get the length you need. 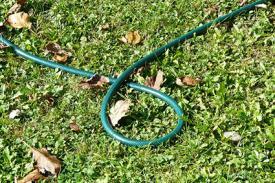 Garden hoses are generally 1/2, 5/8 or 3/4 inch in diameter. The greater the diameter, the greater the water pressure at the end of the hose. Keep in mind that most types of sprinklers require a certain minimum pressure to function properly, an important point to consider when choosing the diameter of your hose. 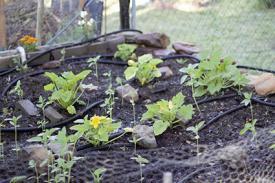 There are a few specialty hoses available for certain gardening applications. 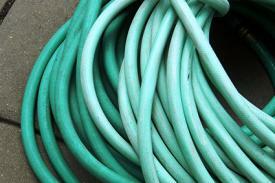 Coiling hoses are useful in small gardens, patios, balconies and greenhouses. 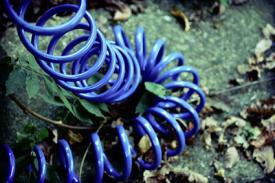 They have the advantage of being kink-free and are essentially self-winding. While they can be convenient, they are less maneuverable than ordinary hoses and care must be taken around delicate plantings. Master Equipment makes a 10-foot coiling hose with 6-setting sprayer included, available at PetEdge for under $40. Soaker hoses are covered with microscopic pores that slowly drip water. They're a great choice for vegetable gardens and newly established plantings that need to be watered often. They can be laid along rows or looped around plants at or below the soil surface. Soaker hoses use less water than sprinklers and help to keep your plants healthy by reducing soil-borne diseases that are transmitted by water splashing onto the leaves. Apex makes an economical 1/2-inch by 50-foot soaker hose, available at Home Depot for just $12. 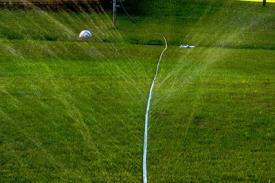 Sprinkler hoses are similar to soaker hoses except they are flat and the holes are bigger, allowing the water to shoot up into the air and out in all directions. They are primarily used for watering lawns. Westward makes a 1/2-inch by 50-foot sprinkler hose, available at Sustainable Supply for about $12. The most common cause of damage is ruptures from kinks in the hose. Be sure your hose is laid out smoothly when in use to avoid kinks. Lay on warm pavement or in the sun for an hour or so to remove kinks. 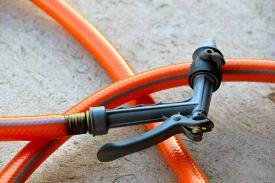 Always store hoses out of the sun, however, as the UV rays break down hose materials quickly. Avoid leaving your hose out over winter in cold climates as any water left inside will expand as it freezes, causing damage to the hose. 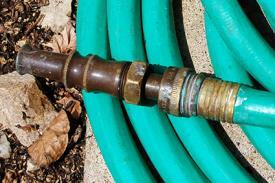 Before the weather turns cold, drain the water out of the hose, coil it loosely and store it indoors. Fortunately, a damaged garden hose can be repaired with a kit from the hardware store. When they are past warranty and worn beyond repair, the pieces can come in handy when staking up young trees. Choosing a garden hose can be a surprisingly complicated decision - there are a lot variables to consider and a lot of products out there to peruse. While it's always tempting to go with the cheap ones, a quality hose will pay for itself in the time and headaches you save from not having to repair it.